During His childhood He exhibited extraordinary qualities, even having philosophical discussions with His mother. While growing, His brilliant intelligence began to become apparent. While still a child, He mastered Sanskrit and logic to the point of defeating local pundits, and established the truth of His spiritual and Vedic philosophy. He became so well known that many logicians of various religious and philosophical persuasions began to fear His presence and refused to debate with Him. Thus, Sri Caitanya established the authority of the Vaishnava tradition through the process of debate and logic. Then, when Sri Caitanya went to Gaya on the pretext to perform ceremonies for the anniversary of His father’s death, He received Vaishnava initiation from Ishvara Puri. Thereafter, He lost all interest in debate and simply absorbed Himself in chanting and singing the names of Lord Krishna in devotional ecstasy. Upon returning to Navadvipa, He gathered a following with whom He would engage in congregational singing of the Lord’s holy names. Thus, He started the first sankirtana (congregational devotional singing) movement, and established the importance of chanting the names of God in this age as the most elevated of spiritual processes, and the prime means for liberation from material attachments. At first, His chanting with people was for the few participants who were a part of His group, but then Sri Caitanya ordered that the ecstasy of love of God be distributed to all people of the area. He gave no recognition for the privileges of caste, or for position, or type of philosophy a person had, or yogic asceticism. He only emphasized the devotional chanting of the Lord’s holy names, using the Hare Krishna mantra (Hare Krishna, Hare Krishna, Krishna Krishna, Hare Hare / Hare Rama, Hare Rama, Rama Rama, Hare Hare) which can bring out the natural loving sentiments for God. It was at the age of 24 when He shaved His head and took the order of sannyasa, the renounced stage of life, when He accepted the name of Krishna Caitanya from Keshava Bharati during the initiation. He then spent four years traveling through South India, and also visited Vrindavana and Varanasi. During this time he also gave special instructions to Rupa and Sanatana Gosvamis, who then also spread the glories of the Divine Love for Radha and Krishna. They settled in Vrindavana where they spent their years in writing many books elaborating the instructions of Lord Caitanya and the glories of bhakti for Radha and Krishna. They also revealed the places where Radha and Krishna performed many varied pastimes in that land of Vrindavana, which have remained special spots where devotees can become absorbed in the bliss of love of Radha and Krishna. Lord Caitanya spent His remaining years in Jagannatha Puri. During this time He was absorbed in ecstatic devotion to Krishna in the loving mood of Radharani, in which He would lose all external consciousness. He freely distributed the divine nectar of this love for Krishna to everyone and anyone, day and night. Even His presence or mere touch could transform everyone that came near Him into the same devotional mood. He remained like this until He finally left our vision at the age of 48. Lord Caitanya is considered and was established by Vedic scripture as the most recent incarnation of God. The Lord always descends to establish the codes of religion. This is confirmed in Bhagavad-gita (4.6-8) where Lord Krishna explains that although He is unborn and the Lord of all living beings, He still descends in His spiritual form in order to re-establish the proper religious principles and annihilate the miscreants whenever there is a decline of religion and a rise in irreligious activity. Though there are many incarnations of God, all incarnations are known and predicted in the Vedic literature. Each incarnation performs many wonderful pastimes. 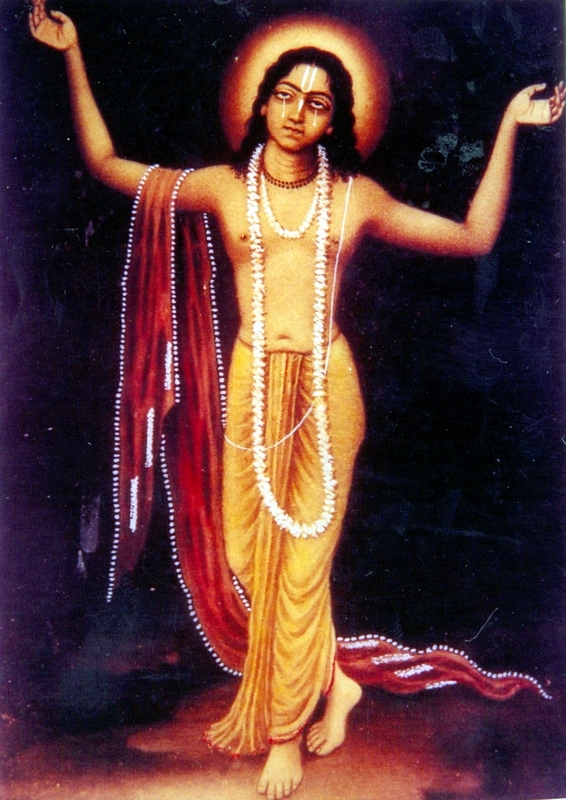 But in Kali-yuga, the Lord descends in the form of His own devotee as Sri Caitanya in order to show the perfect example of how devotional service should be performed, and to stress the chanting of the Hare Krishna mantra for this age by inaugurating the process of the sankirtana movement (congregational chanting). Also, in a verse from the Sama-veda, starting as: tathaham krita-sannyaso bhu-girbanah avatarisye, the Supreme Being says that He will descend to earth as abrahmana-sannyasi at a place on the shore of the Ganges. Again and again He will chant the names of the Lord in the company of His associates to rescue the people who are devoured by sins in the age of Kali. The Caitanya-caritamrita (Adi-lila, 3.19-20) also explains how the Supreme Lord Himself describes how He will appear as His own devotee to perform and teach devotional service by inaugurating the sankirtana movement, which is the religion for this age. How He is the “great master” or will “bestow spiritual intelligence” is described in another Upanishad. This is one of the lesser Upanishads known as the Chaitanyopanishad, or Sri Caitanya Upanishad. This comes from the ancient Atharva Veda. In this description there is not only the prediction of His appearance but a description of His life and purpose, and the reasons why His process of spiritual enlightenment is so powerful and effective in this age of Kali. The Chaitanyopanishad is a short text with only nineteen verses. All of them are very significant. The Sri Caitanya Upanishad (texts 5-11) explains that one day when Pippalada asked his father, Lord Brahma, how the sinful living entities will be delivered in Kali-yuga and who should be the object of their worship and what mantra should they chant to be delivered, Brahma told him to listen carefully and he would describe what will take place in the age of Kali. Brahma said that the Supreme Lord Govinda, Krishna, will appear again in Kali-yuga as His own devotee in a two-armed form with a golden complexion in the area of Navadvipa along the Ganges. He will spread the system of devotional service and the chanting of the names of Krishna, especially in the form of the Hare Krishna maha-mantra; Hare Krishna, Hare Krishna, Krishna Krishna, Hare Hare/Hare Rama, Hare Rama, Rama Rama, Hare Hare. Another interesting story about the prediction of the appearance of Lord Caitanya in Kali-yuga is related in a lengthy conversation between Murari Gupta and Damodara Pandita, two contemporaries of Sri Caitanya. It is found in the Sri Caitanya Mangala, a biography of Sri Caitanya by Srila Locana Dasa Thakura. Among the many things they discuss are the symptoms and difficulties found in the age of Kali, how Lord Krishna appears on earth in this age, His confidential reasons for doing so, and how He revealed to Narada Muni His form as Lord Gauranga that He would accept while appearing on earth in this age. In this form He would distribute love of God to everyone He met by chanting the holy names. This conversation is very enlightening. Within this conversation they further relate an incident recorded as the Vishnu-Katyayani Samvada of the Padma Purana. This is a conversation between Lord Vishnu and Katyayani (Parvati), Lord Shiva’s wife. The story is that one time the great sage Narada Muni acquired the maha-prasada, personal food remnants, of Lord Narayana, Vishnu, and gave a morsel to his friend Lord Shiva. Shiva tasted it and he began to dance in ecstasy, to the point of disturbing the earth. When he was approached by Parvati about why he was dancing so, he explained what happened. However, she was unhappy and angry that he did not share any with her. Being devoted to Lord Vishnu and concerned for the spiritual well-being of all conditioned souls, she then vowed that if she should get the blessings of Lord Vishnu, she would see to it that the Lord’s maha-prasada was distributed to everyone. Just then Lord Vishnu Himself appeared and conversed with her. He assured her that He would appear in the world as Sri Caitanya Mahaprabhu in the age of Kali and would keep her promise and spread His mercy in the form of maha-prasada, food that has been offered to Him, and the chanting of His holy names to everyone, distributing His mercy everywhere. 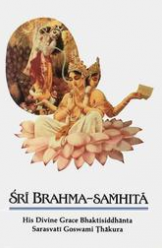 Another book is the Sri Hari-bhakti-vilasa by Sanatana Gosvami. Sanatana lived about 500 years ago in Vrindavana, India and was a great scholar of the Vedic scripture. A portion of the book contains an anthology of an amazing assortment of verses from the Vedic texts which predict the appearance of Lord Caitanya. Besides some of the quotes we have already cited, he includes verses from such texts as the Chandogya Upanishad, Krishna Upanishad, Narada Purana, Kurma Purana, Garuda Purana, Devi Purana, Nrisimha Purana, Padma Purana, Brahma Purana, Agni Purana, Saura Purana, Matsya Purana, Vayu Purana, Markandeya Purana, Varaha Purana, Vamana Purana, Vishnu Purana, Skanda Purana, Upapuranas, Narayana-Samhita, Krishna-yamala, Brahma-yamala, Vishnu-yamala, Yoga-vasistha, and the Tantras, such as Urdhvamnaya-tantra, Kapila Tantra, Visvasara Tantra, Kularnava Tantra, and others. This verifies the fact that the chanting of the maha-mantra is the rare and special opportunity given by God for all to be relieved from the problems of the age of Kali and of material life in general. As confirmed in the Caitanya-caritamrita (Adi-lila, 3.77-78), it is Sri Krishna Caitanya who inaugurates the congregational chanting of the holy names, which is the most sublime of all spiritual sacrifices. Intelligent people will worship Him through this means, while other foolish people will continue in the cycle of repeated birth and death in this material world. In another place of the Caitanya-caritamrita (Antya-lila, 20.8-9), Sri Caitanya specifically tells Svarupa Damodara and Ramananda Raya that chanting the holy names is the most practical way to attain salvation from material existence in this age, and anyone who is intelligent and takes up this process of worshiping Krishna will attain the direct shelter of Krishna. He also strongly opposed the impersonalist philosophy of Shankaracharya and established the principle of acintya-bhedabheda-tattva. This specified that the Supreme and the individual soul are inconceivably and simultaneously one and different. This means that the Supreme and the jiva souls are the same in quality, being eternally spiritual, but always separate individually. The jivas are small and subject to being influenced by the material energy, while the Supreme is infinite and always above and beyond the material manifestation. Sri Caitanya taught that the direct meaning of the Vedic shastras is that the living entities are to engage in devotional service, bhakti, to the Supreme, Bhagavan Sri Krishna. Through this practice there can develop a level of communication between God and the individual by which God will lovingly reveal Himself to those who become qualified. In this understanding the theistic philosophy of Vaishnavism reached its climax. As previously explained, there is a system of self-realization especially recommended for each age. In the age of Kali, people are not attracted to spiritual pursuits and are often rebellious against anything that seems to restrict or stifle their freedom to do anything they want. Since in this age we are so easily distracted by so many things and our mind is always in a whirl, we need an easy path. Therefore, the Vedic shastra explains that God has given us an easy way to return to Him in this age. It is almost as if He has said, “Since you are My worst son, I give you the easiest process.” The Caitanya-caritamrita (Adi-lila, 3.40) confirms this and says that the Supreme Being descends as Sri Caitanya, with a golden complexion, to simply spread the glories of chanting the holy names, which is the only religious principle in this age of Kali. In this way, God Himself has given the method of chanting His holy names as the most effective means to reach His spiritual abode. Sri Caitanya Mahaprabhu did not become much involved in writing. In fact, He only wrote eight verses, but His followers compiled extensive Sanskrit literature that documented His life and fully explained His teachings. For more complete descriptions and elaborations on His life, activities, and philosophy, as written by His close associates, these books that you can order are presently available through various outlets.